Building, Managing, and Migrating Virtual Machines with Hyper-V and Azure is designed to teach virtualization administrators how to use Hyper-V and Microsoft Azure. The course begins by explaining how to deploy Hyper-V and build a failover cluster and create the virtual machines (VMs). From there, admins learn how to create VMs in Azure and how to link the two environments together--both from a manageability prospective, and from the prospective of extending an existing Active Directory to the cloud. Viewers also learn how to migrate VMs to and from Azure. Some workloads probably should be run in the public cloud, while there are other workloads better handled locally. Using the public cloud does not have to be an all or nothing proposition! Building, Managing, and Migrating Virtual Machines with Hyper-V and Azure shows the viewer how to use Azure as an extension to the on premises virtualization infrastructure rather than completely abandoning all local resources in favor of outsourcing everything to the cloud. Azure can be set up as an extension to the local datacenter, and the administrator can run the various VMs in the location that makes the most sense for that particular workload. In the case of a distributed application, that application can be scaled out on demand by deploying supplementary VMs in Azure while the existing VMs continue to run locally. Viewers also learn how to bring a cloud VM back to the local data center if they want to do so! An organization should never put itself into a position of being at a cloud provider’s mercy. 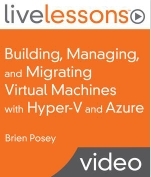 Viewers using Hyper-V and Azure should take note that the Brien Posey has other video courses that complement this topic. One of those videos, Deploying and Managing Hyper-V, teaches the basics of Hyper-V, much of which is not covered in this video. Building a Private Cloud Using Microsoft System Center 2012 R2 is another valuable LiveLessons that shows how to build a private cloud. This lesson is designed to bring the viewer up to speed on Microsoft Hyper-V. It shows how to install Hyper-V, build a failover cluster, create virtual machines, and perform basic VM maintenance tasks. This lesson introduces the viewer to System Center 2012 R2 Virtual Machine Manager. It covers the installation process and basic usage. This lesson is designed to help the viewer get started with Microsoft Azure. It explains how to set up an Azure subscription and how to create Azure virtual machines. The lesson also discusses the architectural differences between Hyper-V virtual machines and Azure virtual machines. This lesson is designed to familiarize the viewer with the tools that can be used to manage Azure, including the Azure Management Console and Virtual Machine Manager. This lesson also discusses Azure Pack. Often Azure is used as a platform for extending an organization’s network to the cloud. The first step in doing so is establishing connectivity between the local datacenter and Azure. This lesson explains how to establish the required connectivity. This lesson explains how an organization’s Active Directory can be extended to the Azure cloud through the use of cloud-based, virtualized domain controllers. This lesson demonstrates using Azure AD Connect to synchronize a local Active Directory environment with Azure AD. This lesson demonstrates techniques for migrating virtual machines to and from the Azure cloud. It shows how to migrate a Hyper-V virtual machine to Azure and how to move an Azure virtual machine into the local datacenter and run it on Hyper-V.